In recent years scientists have fretted over the future of bees, and although research has shed much light on the crisis, those in the bee business—from hive keepers to commercial farmers—say the insects remain in deep trouble as their colonies continue to struggle. The honeybee decline, which is affecting bee populations around the world, is mostly the result of diseases by mites and other parasites as well as the spraying of crops with pesticides. Among the greatest problems is the varroa mite, a bloodsucking parasite that specifically attacks honeybees. Attacked bees often have deformed wings and abdomens and thus a shortened life span. Another major bee pest is the tracheal mite, which gets inside adult bees and clogs their breathing tubes, essentially suffocating the insects. The tracheal mites also impede the bees' ability to fly, making them useless as pollinators, entomologists report. In the early '90s new kinds of pesticides entered the market. Called neonicotinoids and phenylpyrazoles, they damage the nervous system of honey bees. The result? Bees that are unable to communicate accurately with the bees in their hive. Communication between honey bees is essential to telegraph the location of food sources, as well warn about dangerous spots. What's worse, the infected honey bee flies back to the hive to contaminate their entire colony—and a weakened colony dies as a result of this pesticide. Knowing that the use of pesticides, even those targeted at mites, can be fraught with negative consequences, researchers are devising alternative measures to control the mites. Toward the top of the list is the search for so-called biological control agents. One such agent scientists are looking at is a fungus that attacks mites but not the bees. However, research has yet to find a way to effectively deliver this fungus to a bee colony. Researchers are meeting some mite-control success by increasing the ventilation of managed bee colonies. 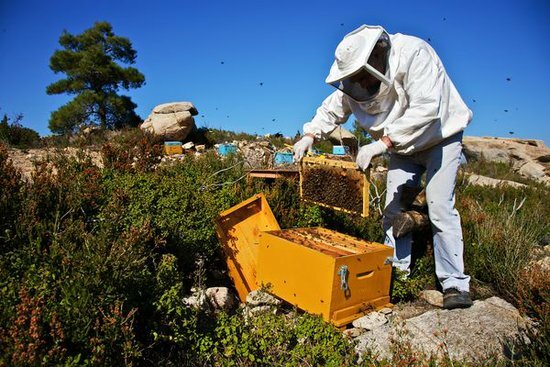 Most colonies are airtight by design, to protect honeybees from the elements. The effect of such systems has been compared to traveling on an airplane. By opening colonies up to greater ventilation, researchers have found that the mites are less successful at reproducing. The bees can better cope with temperature fluctuations than previously believed. Additionally, researchers are also busy combing the world's bee populations in search of bees that are resistant to—or have reduced susceptibility to—the mites. If the researchers can isolate the genes responsible for such mite-defying qualities, they could breed those genes into domestic honeybees. So what’s the big deal if the bees die off, anyway? For one: the extinction of vegetables crucial for sustaining human health—and life. That is, if colony upon colony of honey bee continues to dwindle in size. Why? Bees, via pollination, are responsible for 15 to 30 percent of the food we eat—that's up to one out of every three bites of food on our tables. But in the last 50 years the domesticated honeybee population has declined by about 50 percent. Unless actions are taken to slow the decline of honeybees and augment their populations with wild bees, scientists warn that many fruits and vegetables may disappear from the food supply. Find out how you can help Save the Bees.